Sister Helen is one of the three Sisters of Charity who marked their platinum anniversaries in August, 2017. Sr Clare was on hand to acknowledge Sr Helen’s life dedicated to the Church. “May God’s blessings pour over you today, Helen, as we give thanks to God for you and your service of the poor which you continue so faithfully today. “You are the champion of the little ones. You have the ability to make them feel worthwhile, Sr Clare noted. “Your ministry in education, both primary and secondary, spanned many, many years. You are always happy to admit that you are always learning. After much thought and discernment, you responded to an important ministry which was teaching English to migrants. You have done this with great patience and love. And you never give up on them. “You are delighted to support staff on St Vincent’s Campus, Fitzroy, especially teaching English to those who struggle with it. 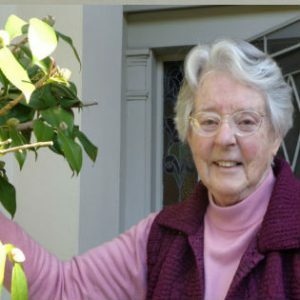 “Your love of family was evident and recently you were saddened by the loss of your dear sister Jan. You are full of love for the Congregation, and age is no barrier to you as you involve yourself in its life and mission. You have a deep sense of social justice, you are non-judgemental and you can be yourself freely. “You embrace change as a good thing in yur life and move along with it. Learning is a gift you always welcome and you have contributed greatly through your own academic achievements. We welcome an article you wrote just recently on the ministry of education in the Congregation. Wonderful, Helen! You are a vibrant woman and a true daughter of Mary Aikenhead. “Thank you for sharing your gifts of humour, genuine interest in others and being able to see the good in others. As you probably realise after we nearly lost you through illness, you work on earth is not finished yet.